For sale below are the plans and kits I have designed, so that you can build your own small wooden boat. I do have some kayaks and canoes already put together in stock as well, so if you are interested in those give me a call. 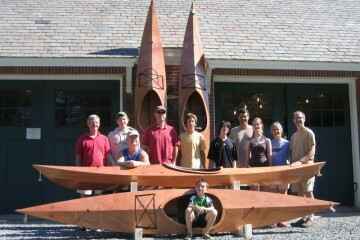 All of these boats are available to be made using stitch and glue plywood. Cedar strip decks are a great way to personalize your boat, and the Hybrid Plans and Kits are my way of giving you a head start. All plans come included with a detailed instruction book, with a step-by-step process on the construction of your boat. 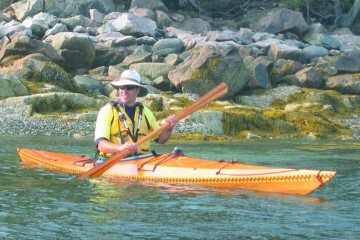 I designed the Merganser as a fun and comfortable kayak. It is intended tohave pleasant performance characteristics including good stability at rest and while leaning. The flaired sides provide extra righting force as the boat is tipped. It also has fairly strong tracking with enough rocker for smooth maneuverability. Its deck shape provides a cockpit with space for big feet while being snug enough so that the paddler doesn’t slosh around in rough conditions or while rolling. It also has enough storage space for picnicking and overnight camping. 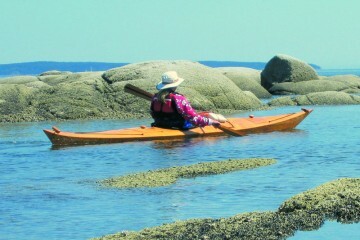 The Baidarka is also designed to be a fun and comfortable kayak with the added feature of its prehistoric good looks. 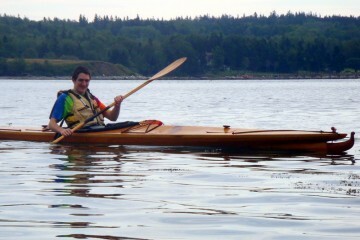 I designed this boat to be as true to the looks of the Aleutian kayaks as possible with improved stability and comfort. The Baidarka features the forked or bifid bow typical of Aleutian Eskimo hunting kayaks. Long waterline length and multi-chine hull make this a fast boat which will handle well in rough water. It is a bit more stable than the Merganser and can easily be rolled. It tracks well yet can easily be turned with a sweep of the paddle. The Widgeon is designed to be a fun boat for people wanting a smaller kayak. It is intended for touring in sheltered waters. 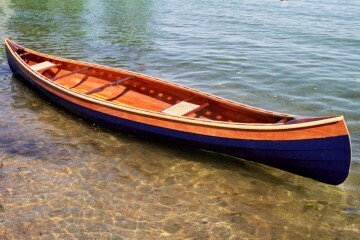 It is a light-weight boat which is easy to paddle and carry. The open cockpit Eider is intended as a boat with the flexibility to be used several ways. She can be used with one paddler or two. She is for exploring quiet lakes, bays and coves, and for photography or fishing, or bringing along your child or dog. I designed the Double Eider to be a small to medium size double for day tripping. She is designed to be quite nimble for a double and as fast as possible for her size. The two cockpit version is quite seaworthy but is not intended for the roughest conditions. The cockpits are separated enough to allow two paddlers to paddle at their own pace. As a double this boat probably requires a rudder for easiest control. 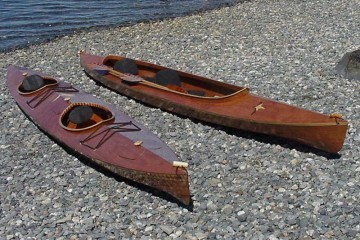 The Double Baidarka is intended as a unique looking expedition capable kayak for two. The long waterline length should make this a fast boat and her shape should make her withstand rough water well. Three compartments will provide plenty of dry storage space. This boat will be very stable and track well.